Are you wondering, how to set an Alarm on Mac OS or What is alarm clock on Mac? If you are new to Mac or working with Mac OS new update, then you may be looking for the way to set Alarm Clock on Mac. There is no direct feature or installed app to set an alarm clock on Mac but there are various ways around to set up alarm easily. 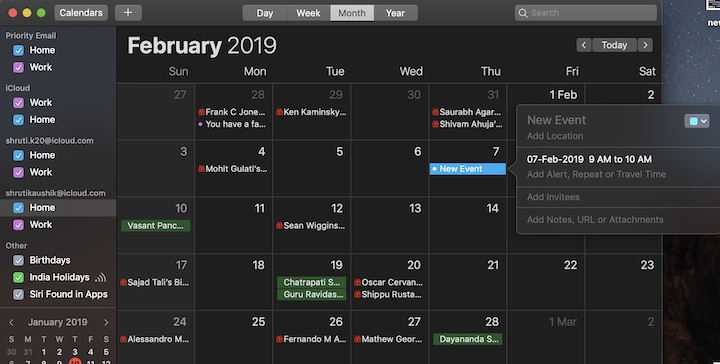 We can either use inbuilt apps of Mac that are directly not providing the function of Alarm Clock but we can use them as Alarm, OR we can also use third party free apps. Also, there are various web tools that can be used to set an Alarm. Let’s see these methods in detail. Let’s understand all the methods one by one. There are two built-in apps on your Mac that can be used to set Alarm on Mac. Step 1. Click the Calendar icon located in the Dock of your mac. if not, simply use ‘Command+Spacebar’ to search any file or app on your Mac. Search for Calendar app and open it. OR To go to the “Calendar” (in case it is not present in the dock), click “Go” and select “Applications” and then double click on “Calendar”. This will launch the “Calendar”. Step 2. Double click on your choice of date/time for the alarm. To name the event, click on “New Event” displayed right below the date. Step 3. You can select the date/time interval for the alarm as well. Similarly, options like Repetition (Snooze) and Travel Time are also available for helping you take a complete action on alarm cycle. Note: These options are best suited for meetings. Step 4. To turn the alarm off on basis of date/time, click on “From” section. Step 5. To select “Alert” click on custom; available in the drop-down menu. Step 6. The first drop down option will be “Message With Sound”. Select your choice of music- applicable when the alarm is on. Step 7. You can add invites, notes, URLs, and attachments in your event, in case you are setting an alarm for a group meeting. These options are available when you set the event. Step 8. To select your own audio file or launch music of alarm, chose the option available on the hard drive of your mac. Step 9. Select “At the time of event” available from the drop-down menu and click on “OK”. This is how setting alarm on mac is done. That’s it. In this manner, you can set Alarm on Mac easily. 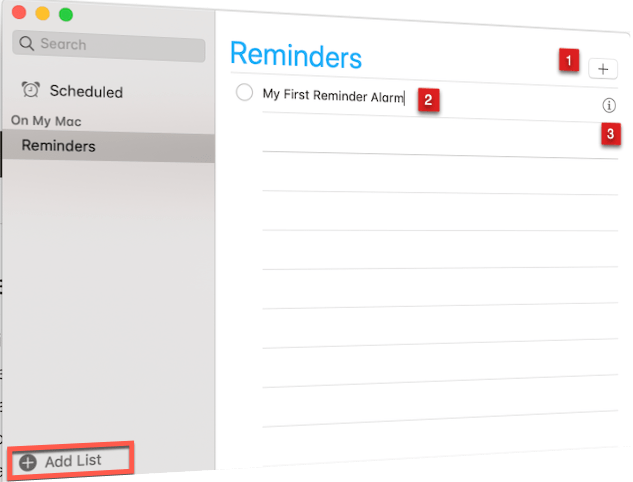 Reminders App is another built-in app on your Mac, that can be used for setting up an Alarm. The basic function of reminders app is to remind you of the various task that you have set in it. So, if you are a businessman and have a lot of tasks to do, then this is the perfect app that can help you to manage your day. So, in this app also you can set alarms for various named tasks. Step 1: First Open Reminders App, through Dock icons or Launchpad or Spotlight Search (Command+Spacebar) etc. Step 2: Once you opened it, click on the ‘+’ icon on the Top right of the window and named your Reminder or Alarm, for ex: I gave ‘My First Reminder Alarm’. This Alarm will be created in the default list, you can also create a new list by just clicking on the ‘Add List +’ icon from the Botton Left corner as shown in the Image given below. You can also use third-party apps to set an Alarm on Mac. one of such great apps is; Wake up time: Alarm App for Mac’. You can find out this app on App Store and Install it after downloading. The user interface of this app is pretty simple. You can set the Alarm time, type of Sound, Volume of Sound from the right pan. You can off/on Alarm from by clicking on the Round button from the Bottom Left corner. The Alarm set by this App will work even if you have muted your Mac, but if you have shut down Mac, then it will not work. In case, if you are not satisfied or don’t want to use built-in apps or also don’t want to download any third-party app, then you can also online tools for setting up Alarm. This is a Free website, where you can set an Alarm, Timer, StopWatch etc. This platform gives you many more features like you can play small Games on it. Overall a platform that can be used, in case you are outside and have not your Mac with you. This is another online platform, where you set a timer and after that time it will alarm you about the same. Now you are aware of the built-in Apps, third party App and online tools to set an Alarm on Mac OS. These are the best methods you can use for Alarm Clock on Mac. If you have any query or suggestions, kindly share with the world in the comments.